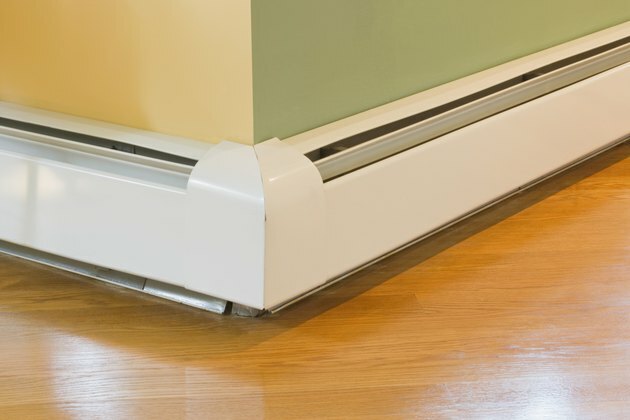 Metal baseboard heaters have covers that hide the cables and various heating elements inside. Even if the heaters work perfectly, the covers could rust over time. This is especially true if you have baseboard heaters in areas of the house with high moisture levels, such as the bathrooms or kitchen. You can replace these covers but you might have to pay a high price for new ones. Simply painting can help restore the appearance of the baseboard heaters. Paint can help refresh the look of old baseboard heaters. Remove the baseboard heating cover, unscrewing the fasteners, leaving only the heating element attached to the wall. Usually, a baseboard heater has two removable sections. Sand the entire baseboard heater cover with steel wool to remove the rusty areas. Brush on a rust-removing product containing phosphoric acid on any remaining rust. The rust will darken and undergo a chemical reaction that allows paint to easily adhere to the heater cover surface. Apply metal primer to all the surfaces of the baseboard heater cover with a bristle or sponge brush. Let the primer dry. Coat the cover with protective enamel paint or metal paint. Reattach the cover to the wall.